Make the dough: Heat milk to about 98°F, or warm to touch. In a mixing bowl, add yeast and 2 tsp sugar. Pour 1/2 cup of warmed milk over the yeast and sugar and stir. Let sit until yeast is activated, about 10 minutes. Add in the remaining milk and sugar and stir until sugar is dissolved. Add in cinnamon and cardamom. Stir in about half of the flour while working the dough with a dough hook in a stand mixer. Add in remaining flour, starting with the smaller amount. Add the salt and cubed butter and work until incorporated. Continue working the dough for about 10 minutes or until completely smooth and elastic and the dough pulls away from the bowl. Add more flour if needed, however the dough should be a little sticky to the touch. Don’t add too much flour or the buns will become dry when baked. Cover the bowl with a damp, clean kitchen towel and let to rise in a warm place for one hour. Make the filling: While the dough is rising, beat butter, sugar and cinnamon until fluffy. Set aside. 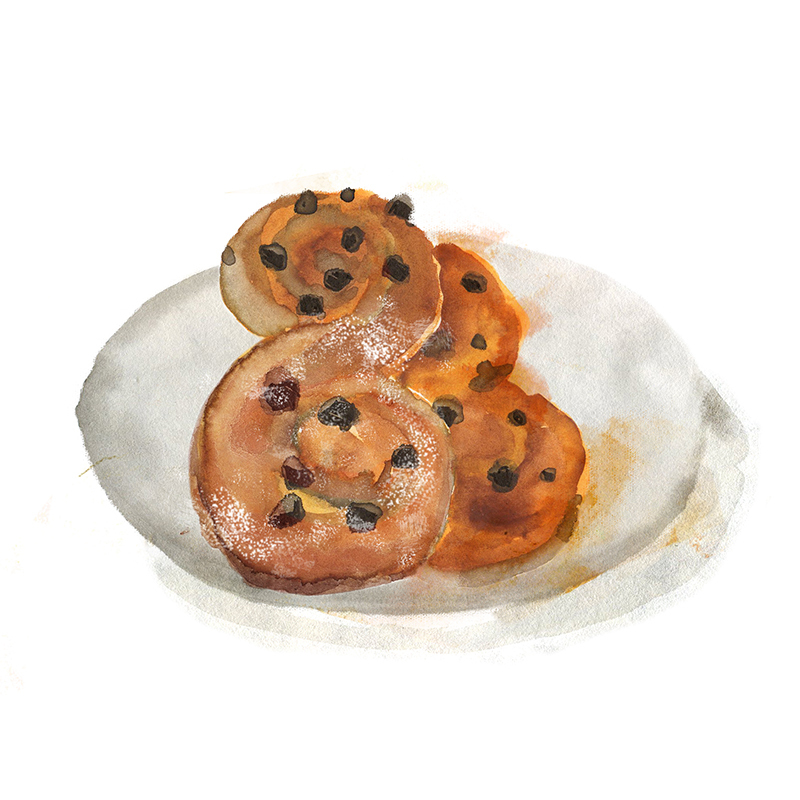 Place raisins in a small bowl and cover with white wine or mulled wine (if using), or cold water. Set aside. Shape the dough: Line two baking sheets with parchment paper. On a floured surface, roll out the dough into a 20 by 12 inch rectangle. Spread the filling evenly over the dough, almost all the way out to the edges. Scatter a handful of raisins across half the dough (reserve some for sprinkling on top). Fold the dough once across the shorter side, ending up with a 10 by 12 inch rectangle. Use a pizza cutter or knife to cut alongside the shorter side (10 inch) of the dough into 16 strips (or 8 strips if making large rolls). Each of the 16 strips should be a little more than 1/2 inch wide and about 10 inches long. With the cut side up, shape the strips into an S-shape* and place on the prepared baking sheet, leaving some space between each bun. 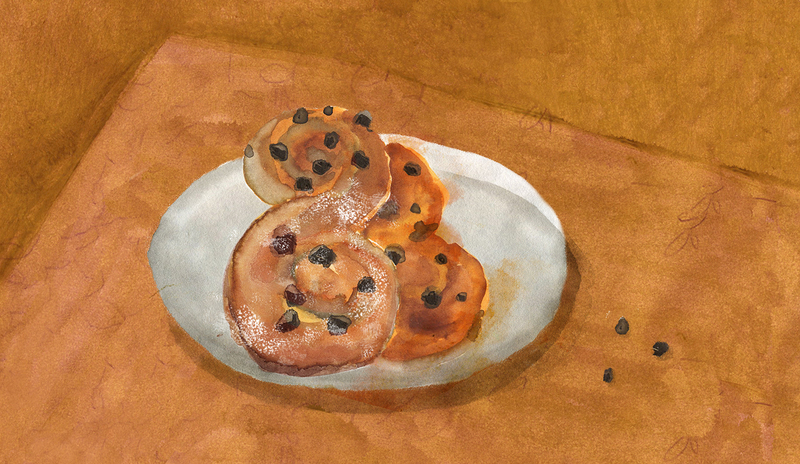 Place remaining raisins in the buns and cover with a clean kitchen towel. Let rise in a warm place for 45 minutes. Make the syrup: While the buns are rising, prepare the syrup by bringing sugar and water to a boil in a small saucepan. Simmer until sugar has melted. Set aside to cool. Bake the rolls: Whisk together egg and milk in a small bowl. Brush the buns with the egg mixture and sprinkle with demerara sugar. Bake one sheet at a time, for 9-11 minutes or until the buns are golden brown. Immediately after removing the baking sheet from the oven, brush the buns with the syrup. Let cool for 10-15 minutes before serving. If you have leftovers, freeze them the same day they are made. *Alternately, the buns can be shaped into small knots.